"Why am I STILL suffering from NECK AND/OR SHOULDER pain after putting up with it for six months (or more)?" Most people hope that they'll wake up one morning and "like magic", it'll be as if the neck and/or shoulder pain never happened. But it never happens, and the longer these people wait, the worse their suffering becomes. 1. You thought it would go away on its own, but it didn't. 2. You went to the doctor, who told you to rest and take painkillers—but the pills just masked the pain, and as soon as they wore off, neck and/or shoulder pain stopped you in your tracks again. 3. A loved one told you that everybody gets neck and shoulder pain as they get older, so you just accepted it. 4. You tried other healthcare professionals like physical therapists in the past, but nothing they said or did seemed to help. 5. You tried ice, heat pads, and YouTube stretches, but nothing helped, and some of it even made the pain worse! 6. You thought it would be a good idea to rest, but your neck or shoulders still irritate you. 7. You decided to try a massage, but while it was relaxing and felt good, it hasn't done anything to fix the pain! If any of these have happened to you, we would love to invite you to schedule a complimentary telephone consultation with one of our first-rate physical therapists so we can help you. The fact that you've tried any or all of these things already, like many people we see, is actually a GOOD THING! When you know what doesn't work, you are closer to finding the thing that does! "What Can I Do To Get Rid Of My Neck And Shoulder Pain Quickly?" 1. ​First off, you need to make a decision about getting help. So many people procrastinate for so long, thinking that neck and/or shoulder pain will "just go away with time," but then six months down the line they're still putting up with it! 2. Next, do the RIGHT exercises! One of the best things to help you ease your neck and/or shoulder pain is to do the right series of progressed exercises—the right exercises given to you by a physical therapist will help reduce pain and allow you to move freely again, AND make sure that the problems don't come back! 3.​ Avoid sitting or sleeping in awkward positions! Ever woken up with a painful neck? Or, after a long day of sitting, felt tightness in your shoulders? That's because one of the worst things you can for your neck and shoulders is sit with bad posture and sleeping in awkward positions! 4. ​Get real, "hands-on" physical therapy! Physical therapy, especially manual physical therapy, is proven to help people with neck and shoulder pain. In fact, at Berman Physical Therapy, it's one of our specialties! If your neck and/or shoulder pain is affecting your job, threatening your ability to keep active, destroying your independence, or getting in the way of spending quality time with family and friends, physical therapy can help get you back to the active life you deserve! 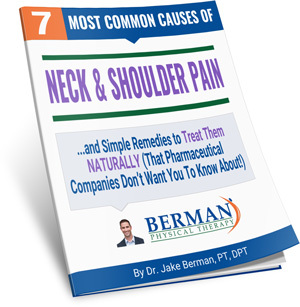 "How Can Choosing To See A Physical Therapist At Berman Physical Therapy Help You Get Rid Of Your Neck And/Or Shoulder Pain In The Next Few Days? Here are just a few of the things our physical therapy team can do for you! We can help you avoid dangerous surgery—and painful injections. Basically, we can help you get back to living life free from the curse of chronic neck and/or shoulder pain! It's a good experience. I can play golf again! I'm the queen of physical therapy... and this is the greatest one I've ever been to. This isn't your grandma's PT! I don't have pain anymore.